Review posted January 18, 2015. Random House, New York, 1968. 184 pages. This is Book 9 in The Three Investigators series. This may be about where my brother stopped letting me read his copy when I was a kid. This Interlibrary Loan process is great! 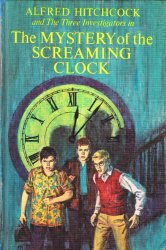 The Mystery of the Screaming Clock is another puzzle-based mystery. It starts with an alarm clock that, instead of a normal ringing alarm, gives off a piercing scream of a woman in mortal terror. The clock turned up at the junkyard, and now Jupiter Jones wants to solve the mystery of who would create an alarm clock that screams. They discover a whole room full of screaming clocks made by a man who once did sound effects for an old radio mystery show. Not surprisingly to the reader, this turns to a mystery involving art theft and an innocent person who needs his name cleared and another boy who gets to take part in the investigation. Then act! The result will surprise even you. Clearly, The Three Investigators need to find Rex, Imogene, Gerald, and Martha. This leads them, eventually, to cryptic clues and a puzzle to solve. But they are not the only ones trying to solve this particular mystery. The story does include the usual mortal peril for some of our heroes. It doesn’t include the rival gang of bullies, and I thought it the better for that omission. I enjoy the puzzle mysteries in this series, though this one had one part of the clues in a form readers couldn’t possibly figure out themselves. But the story of kids chasing down clues and cleverly solving a mystery with fast-moving action does hold up after almost 50 years.